Say it once, say it again. Today is an important day. Very important. It could change the course of history, the course of this country, and the world around us. Like everyone out there, I am beyond tired of the political flyers that fill my mailbox, the commercials that squeeze out standard product placement ads, and the robo-calls that haunt the solitude I seek within the walls of my home. Living in Colorado has been far from peaceful since August. Colorado is considered a “swing state”; we could go either way and the results of this campaign could have a significant impact over which party controls the Senate. The attack ads, finger pointing, and incessant nastiness make it difficult to sift through the mud-slinging and decipher the truth, leaving me with the taste of bile in my mouth. I often wonder what our Founding Fathers would think if they were able to step into the TARDIS and visit our world today. More often, though, I think about the women who fought for my right to vote and I recommit myself to not wasting their efforts. A couple of years ago, I wrote a post about my daughter’s first voting experience. In it, I share the photos and history of the women who came before me and my mother, the women to whom I owe a very large debt of gratitude and whose story should never be forgotten. As the mother of 2 girls, I have been determined to share with them the history of the women who voted before them, the story of their great-grandmother and so many other women who fought to earn that right for themselves and for women they would never meet but whose lives would be changed because they were finally allowed a right once reserved for men. I have been determined to teach them about the responsibility they have to vote; to become informed, make their voice heard, and not be discouraged by the media predictions or contentious campaign drivel. And, as always, I am determined to teach by example. I’ve said it once, and I will say it again, I will not waste my chance to be heard. What will you teach today? Okay. In all honesty, the most humbling thought I had this morning was . 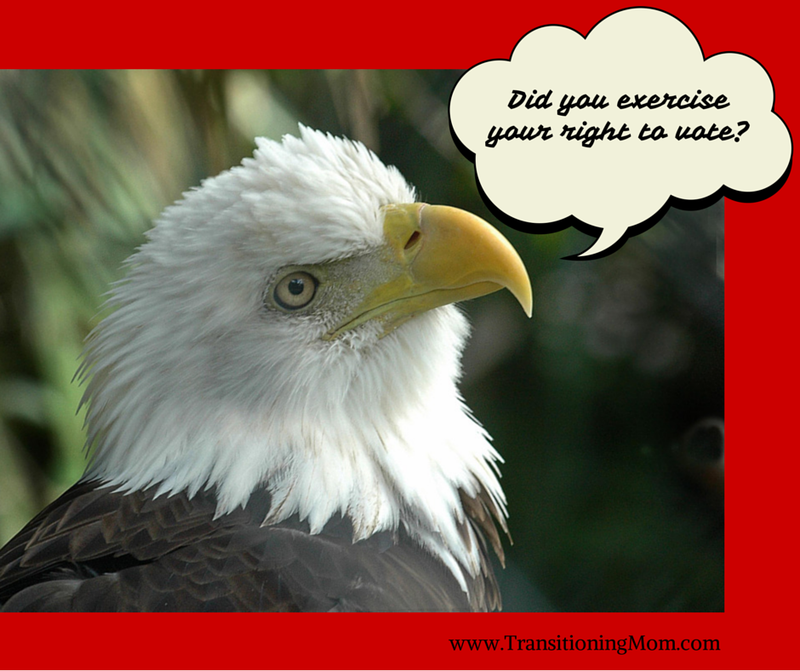 . . did my 21 year old son ever register to vote? My dad probably turned over in his grave. I did vote today, but felt a bit mom fail that my son didn’t. I need to make sure this doesn’t happen again. Great post Mary. This is so important and for sure needs to be taught by example. Can’t wait to come back and visit your linked post…sad I don’t have more time right this second! And I agree 100% percent with Carol too! It’s not just a right. It is a privilege and I’ve always loved it. You, too, I see! It is a true privilege that I have always loved, Carol. Absolutely! I’m with you all the way. I took my kids into the voting booth with me when they were little just like my parents did with my sister and me. They’ve seen me sign petitions, march for equal rights and write to politicians. Our vote is an important way to make our voice heard – although, lately, I’ve also had to do that with my pocketbook. I’ve stopped shopping at stores whose executives/owners support causes I am totally against. And I totally agree with you about all the political mailings. What a waste of paper. My completed mail-in ballot is just about a foot from my knee. I was going to go drop it off once Littler J awakened, but now I wonder if I ought wait until I have Li’l D with me … so I can, in fact, teach him (high level!) what this all means. Voting has always been a whole-family experience at our house. Currently there’s only one of our daughters at home with me while my husband travels for work and our other two are off at college. But she and I voted together this morning. It’s a great tradition. And I’m with you about the ugly voting flyers in the mailbox. We got 12 yesterday. Yuck. I loved sharing my older daughter’s first voting experience with her and I look forward to doing the same with my younger daughter next year. I think it reinforces the privilege and the responsibility that comes with voting. My son’s passion is politics, so he’s very involved with it. Heck, he’s overly involved. But that is not a bad thing, except we rarely agree on issues.But I’ll fight to the death his right to his own opinion. He’s helped get the word out about several campaigns day and night all last week and yesterday in between school and work, and asked me dozens of times if I”m voting. If I’m voting? Who taught him about the importance of voting? Hahahahahaha. You are both teaching and leading by example Mary! Thanks, Ruth. They are always watching.